The NY Times is reporting that Barack Obama will ask Secretary of Defense Robert M. Gates to stay on. Who is Robert M. Gates, and how does he fit with Obama’s other advisors, particularly in respect to relations with Israel? 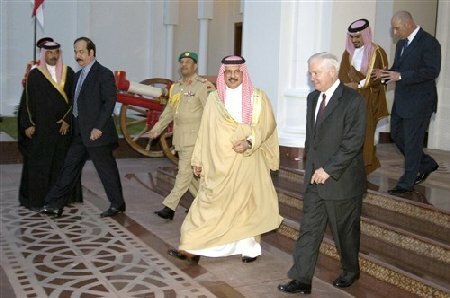 Gates is 65, a career CIA man who joined the agency in 1966 and served as its director from 1991 through 1993. In 1979 he was Special Assistant to the Assistant to the President for National Security Affairs in the Carter administration. In 2004 he co-chaired — with Zbigniew Brzezinski — a Council on Foreign Relations task force which issued a report called “Iran: Time for a New Approach“. Much of the material in the report is informed and unexceptionable. But where Israel is concerned there are some jarring moments. If Iranian leaders have wanted restraint, they certainly haven’t demonstrated it by arming Hezbollah with the thousands of missiles used in the 2006 war, by training its armed forces, and by building it a state-of-the-art command and control system which Israel reportedly was unable to penetrate. Since 2006, Iranian efforts on Hezbollah’s behalf have redoubled. The Shebaa Farms issue is simply a pretext for Hezbollah’s aggression against Israel. The area is tiny, totaling about 8 square miles, and has practically no strategic importance. Israel’s position is that it was part of Syria before 1967, and is now part of the occupied Golan Heights. Hezbollah claims that it was Lebanon’s and that therefore Israel is still occupying Lebanon; this then justifies its ‘resistance’. When Israel left southern Lebanon in 2000, it requested that the UN delineate the border just to forestall this sort of pretext; unfortunately, the status of the Shebaa Farms remained unsettled. Gates and Brzezinski should know this. Suggesting that handing Hezbollah yet another victory, this one over 8 square miles, would impel it to give up its ‘paramilitary activities’ — in fact a massive war-making machine with (today) more than 40,000 missiles, miles of fortifications, etc. — was beyond absurd, even in 2004. But since it should be obvious that Palestinian ‘resistance’ is aimed at the ‘occupation’ which began in 1947, and not 1967 — terrorist groups like Hamas have been quite up-front about this — ‘progress toward a peace agreement’ does not tend to quiet them. Indeed, these groups violently oppose agreements like the Oslo accords because they oppose any solution which leaves Israel standing within any borders. Since it’s obvious that there’s no possibility of getting real economic sanctions against Iran, what’s left to ‘pressure’ them with? Maybe a deal in which Israel gives up her nuclear deterrent in return? As I’ve previously written, Mr. Obama’s foreign policy team appears to have what I would consider an anti-Israel tilt. It will be very interesting to see whether Hillary Clinton, who has been very pro-Israel in her senatorial role, will oppose or go along with this tendency. Update [26 Nov 1009 PST]: Barack Obama is expected to name retired Marine Corps General James L. Jones as National Security Advisor. Jones has advocated sending NATO troops to the West Bank and has criticized Israel for placing obstacles in the path of the US project of arming and training Palestinian Authority (i.e., Fatah) forces. See Steve Rosen’s blog here. This entry was posted on Tuesday, November 25th, 2008 at 10:51 pm and is filed under General. You can follow any responses to this entry through the RSS 2.0 feed. Both comments and pings are currently closed. I am sorry to say that what I foresee for Hillary Clinton is a Condeleeza- ization at State Department. She will not be able to stake out a strong position as more pro- Israel than the President without facing tremendous criticism for being disloyal, and pursuing her private political agenda. I believe the ’tilt’ towards a policy which is inimicable to Israeli interests will come, perhaps even very soon. I do not believe it will take the form of direct pressure against Israel of a kind which might arouse Congressional opposition. It will come by a series of initiatives towards those hostile to Israel, first of all , Iran. It will come through strengthening forces, even military forces in the Middle East which are potentially dangerous to Israel. It will come through shifting toward multi- lateral initiatives in the U.N. and elsewhere. However I believe that Obama would not at this point risk his tremendous popularity and political capitol to take on Israel now. What I suspect is that there will come an effort to somehow discredit Israel by making it time and again seem as the stubborn one, the odd man out, the one who persists in Occupation, and does not want peace, the obstacle to the U.S.’s winning universal love in the Middle East. I hope I am wrong. But I believe we are heading for very tough days ahead. Yes, if being a realist means one agrees with the “linkage theory,” then in principle, it does not sound bad. It is not exactly expressing support for Iran. I think sometimes, and I have mentioned this before, the term “peace” gets supplanted into the mix, but really, it is an appeal to the rational elements of Islamic society. This is a positive article and the excerpts are good. I don’t think the concepts pigeon hole Israel to the extent you indicate. This is a good reference for April 12, 2009 or April 10 blog comments on legal realists stuff.